Here we have compiled a list of terms specific to physical security. We hope you’ll think of it as your Locksmith Dictionary. 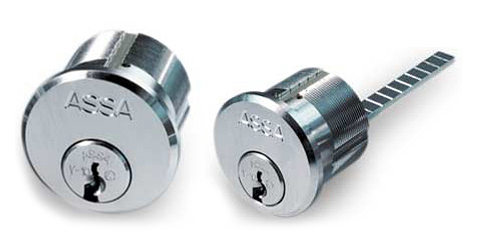 Magnetic Locks, or Mag Locks, are the most basic type of electronic locks on the market. An armature is mounted onto a door and a large electro-magnet is mounted to the corresponding door. Mag Locks are difficult to tamper with and easy to install. A Mortise Lock requires cutting a mortise, or pocket into the door or furniture in which it’s being fitted. A lock trim, strike plate, lock body and keyed cylinder are typically included in a Mortise Lock installation. A Cylinder (also known as Lever Tumbler) uses a set of levers to keep a bolt stationary within the lock. Most often, a bitted key is used with Lever Locks. Interconnected Locks combine the simple exit of knobs or lever handles with the extra security of a deadbolt. There are a wide range of uses of Interconnected Locks for both residential and commercial buildings. Bottom pins have points on one end, to enable easy key movement. They are the first pins to be inserted into the core, and are never used as wafers. Part Number 12636, -0 through -9. Wafers are used for the control key, as top pins, and for master keying. Both ends of wafers are flat. The locking lug is the section of the sleeve that can only be rotated by the Control Key. It is the section that retains it in the different locks. Unless cores are ‘keyed alike’, the change key will only operate or open one core. The control key only operates the sleeve, by doing so the locking lug is rotated. This allows a core to be removed or inserted from its lock. Chambers refer to the Sleeve, Housing, and Plug holes. The Control Shear Line is the section where the Sleeve meets the Housing. To rotate the locking lug, all the pins must all be level when the Control Key is inserted. The Operating Sheer Line is the section where the Plug meets the Sleeve. To operate the core, all the pins must be level when the master key or change key is inserted. The total height of all the pins within a pin chamber.